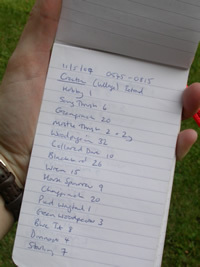 Keeping a record of the birds we see is one of the most useful aspects of our birdwatching. Although you may not think your own personal records are very significant, when you combine them with records from other birdwatchers in the same area they provide a valuable historical record. Over time, records can be compared and will give between-year changes in the patterns of occurrence of common species as well as details of breeding, distribution and movements. Recording birds regularly from the same site can contribute to a greater understanding of the ornithological value of the site and may provide important information for site safeguard and to evaluate the effects of site management. This gives real conservation value to your records. By submitting your records to BirdTrack throughout the year you will not only be storing your records in a secure place but also increasing their conservation value as they are pooled with records from other observers across Britain and Ireland to create the wider picture of the migrations, movements and distributions of birds. With your permission we will also forward your records to local bird recorders so that they contribute to ornithology and conservation at a local level. A great deal of useful information of this kind can be obtained by simply collating the records collected by birdwatchers during their normal birding activities. However, other questions such as the systematic monitoring of numbers over time require planned surveys. Volunteer birdwatchers make a vital contribution to surveys of this kind.